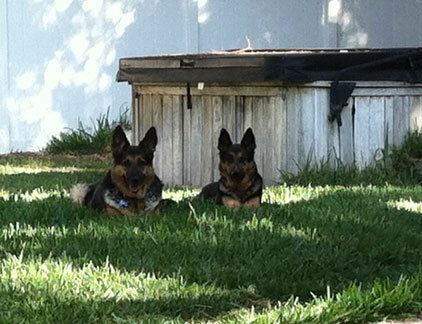 Here is a photo of George and Martha (adopted in 2006 from GSROC). They are doing great! They had a rough May when they lost their older GSD “brother” but have recovered with more outside play time with the rest of the family. Martha loves to play hide-and-seek with her teenage human brother and they both love to help me wake their teenage human brother up in the morning for school. We are so glad they are a part of our family!